How cute are these Ice Cream Cone Cupcakes with a buttercream swirl? Not only do they look incredibly cute, but they taste amazing too! 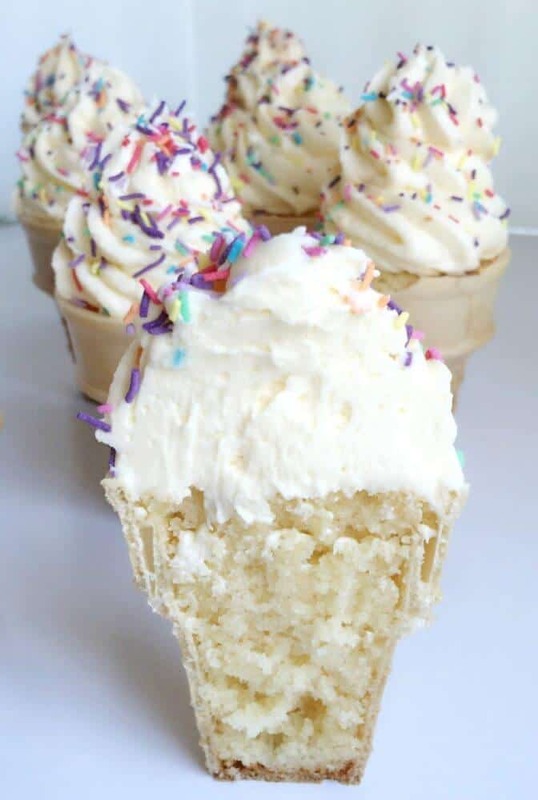 You bite into the crispy cone, filled with fluffy vanilla cake, topped with creamy buttercream and sprinkles. It doesn’t get much better than that! They are perfect for birthday parties, a special treat for kids or a sneaky sweet treat for you. I used my basic vanilla cupcake recipe to fill them, but you can use a packet cake mix if you like. No need for special trays to bake them, I just use a flat baking tray and am careful not to tip them when placing in the oven. For my full buttercream recipe and tips, check out Vanilla Buttercream Icing Recipe. Preheat oven to 160ºC and place the ice cream cones on a flat baking tray. Using an electric mixer, cream together butter and sugar on medium speed until light and fluffy. Add vanilla extract and eggs. Mix until combined. Add flour and milk. Mix on high speed for 2 minutes. Using an ice cream scoop or spoon, place the mixture evenly into the ice cream cones filling them 3/4 of the way full. Place in oven and bake for around 10-15 minutes or until a skewer comes out clean. Using the whisk attachment on your stand mixer, whip the butter on medium-high speed for around 4 minutes. You want to beat the butter until it is pale and light. Increase the speed to medium-high, add the vanilla extract and food colouring, continue to mix for around 2 minutes until the mix is light and fluffy. Using a piping bag and large star-shaped nozzle, spoon the mixture into the piping bag and pipe a swirl on the top of the cones. Oh my these are so cute. I had to read it to make sure the cream was not ice cream. I think I will try these with a white chocolate butter cream.